The first point to make is that I'm not at all religious. If I had to label myself as being the follower of any religion it would probably be Buddhism. However, I regard Buddhism as a philosophy in life and not as an organised religion per se. For me, the best place to follow Buddhist teaching is in my heart and mind, not in a temple. 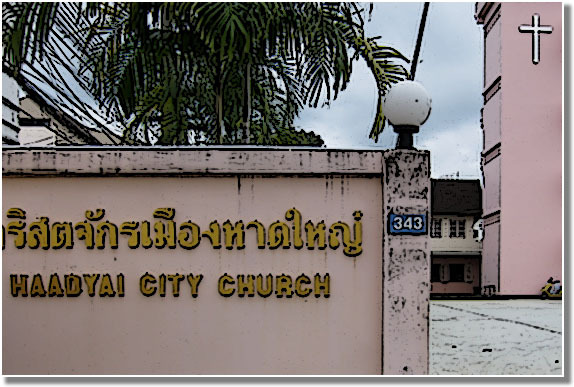 The reason for creating this page is that quite a few people search for churches in Hat Yai. The predominant religion in Thailand is Buddhism. Buddhism is probably the most tolerant religion of all, and there is great respect among Buddhists for followers of other religions. When King Mongkut (Rama IV) first opened Thailand up to the outside world he invited foreign missionaries into the country and listened carefully to what they had to say. Missionaries were given land on which to build churches and allowed to spread their message. A few Thais have converted to Christianity, but not that many. There are Catholic schools in Hat Yai run by Thai Catholic priests and nuns. At these schools, however, you will find that the vast majority of students are Buddhist. Some are Muslim and a few Christian. Thai Christian students are usually Christian because their parents have converted. The following listings just give some very basic information. I can probably help you with locations, but I can't answer questions about the specific doctrine of any particular church or anything technical regarding theology. Comments: This small church sprung up some time in late 2017 or early 2018. It's in the Kuan Lung sub-district of Hat Yai on the Airport Road quite near to the airport. Comments: One map I have says the church at this location is called 'Our Lady of Lourdes Church' (which sounds very Catholic). The English sign outside just says Catholic Church, but the Thai script does appear to use a poor transliteration of Lourdes. It is located right next door to Saengthong School, which is a Catholic boys' school run by Catholic priests. There is also a Catholic girls' school in Hat Yai (Thidanukhro School) run by Catholic sisters. The vast majority of students attending these schools are Buddhist. Comments: I thought all churches were Christian? This one is located near Gim Yong market, the fresh market and the clock tower. Comments: Our Sunday services start at 10:15 and finish at 12 noon with a free lunch. The service is in Thai but there is translation for foreigners. We are an evangelical church welcoming all visitors from all over the world. We have Africans, Indonesians, Americans as well as a Kiwi attending! Please feel free to join us. Comments: This Christian house of worship is located overlooking the canal at the back of Big C Extra (formerly Carrefour). Unfortunately, I have no details regarding the denomination of Christianity practiced there or service schedules, etc. Comments: This church is outside of central Hat Yai, located near the Klong Hair district where you will find the floating market. It is tucked away right at the end of a very quiet Soi, and quite difficult to find. It is also difficult for me to explain how to get there. I have provided GPS coordinates. If you have a SatNav device, just plug these coordinates in and it will take you there. You can also use these coordinates with Google Maps to see a street map or satellite view. As well as a service on Sundays there are activities on Tuesdays and Fridays. The woman I spoke to, who appears to live there, said they organise activities for teenagers. Comments: From the outside this church looks just like a house, but don't be fooled by external appearances. From the outside the TARDIS looked just like a police box. It is located at the end of a small Soi a short distance from the Bangkok Hat Yai hospital. Update: When I went to check out The Bless Residence I walked to the end of the Soi, where this church was located, to see if it was still there. It wasn't. I therefore believe that the TARDIS has now been transported to another time and space dimension. Comments: This small church, which looks just like a regular house from the outside, also bills itself as a 'Missionary Mission Training Center'. I don't know where the missionaries come from or where they are sent to pass on the teachings of the Lord. The location is quite near Diana Department Store. Comments: This church (again, it looks just like a regular house or commercial building) is located on the airport road a few kilometres before you arrive at the airport. On Sunday there is a bible reading class from 09:00 to 10:15, a prayer session from 10:30 to 11:45, a sharing session from 11:45 to 12:30 and more prayers between 20:00 and 21:00. The pronunciation is obvious if you read Thai, but the English transliteration is highly confusing and I can guarantee that English speakers who don't read Thai will get the pronunciation wrong. Comments: This church may be a little tricky to find. It is near Koke Samaan Kuun temple. There is a map on their web page. From central Hat Yai, go over the railway bridge towards Hat Yai Nai. Just as you cross the bridge (past the police station) do a U-Turn and then turn left. You will see a temple on your left. Turn right and go into the road opposite the temple entrance. Turn right and you should see the church on the right. It's just a small building.